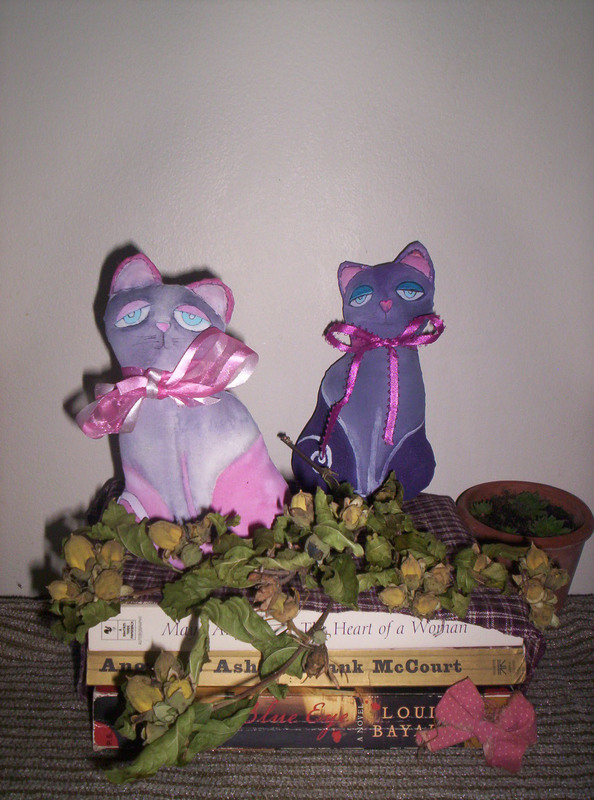 At 7 inches small this little kitten with big baby blue eyes sits perfectly on top of books and dried flowers. 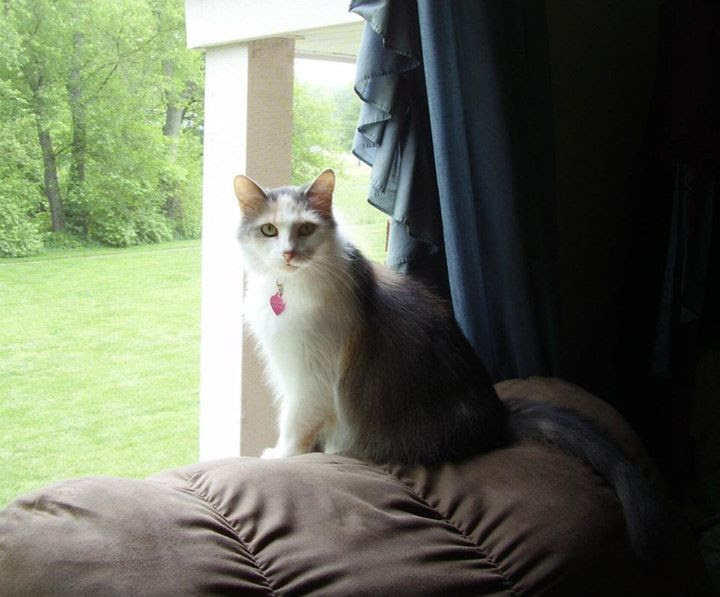 She wears an oversized, removable pink ribbon and has tiny little gray whiskers. This little one is completely hand made, hand painted and is made of almost 100% recycled materials including her stuffing and the ribbon. I hand painted the head and paws with deep purple mixed with gray to give her painted fur texture and depth. I then added white water soluble ink over the top of that to soften it up. I have to say I like how it turned out. The lower half of her body is pink with tiny hints of fuchsia then finished off with white ink. The back side of her is almost completely deep purple and shows her white tail very well. Just below her tail on her tiny little bottom are my initials. This is the second cat I've done. The first as seen in the second picture which gets pretty large, shows a two toned purple cat with baby blue eyes sitting beside the pink baby on top of books. That cat has been adopted but the lighter colored cat has not. 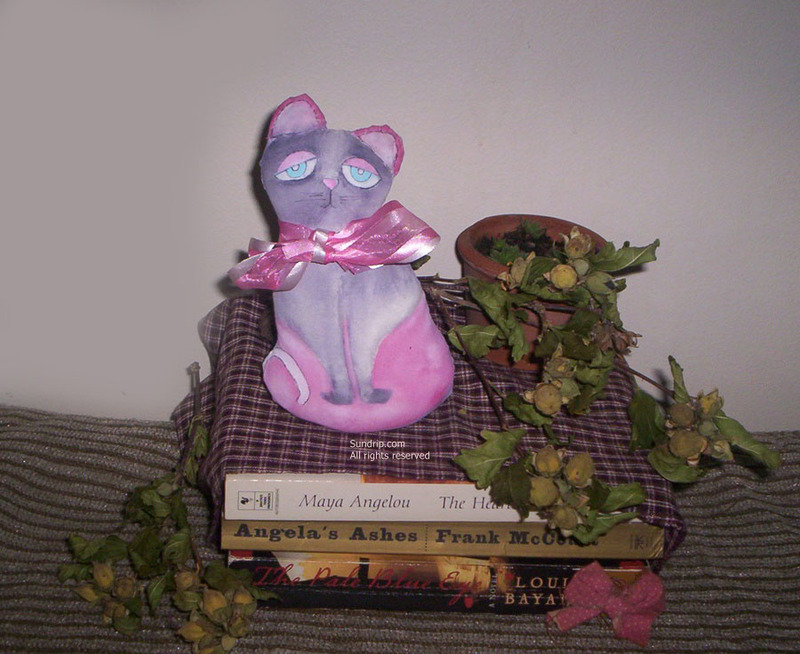 If you'd be interested in adopting the pink kitty with baby blue eyes please see my Etsy shop link on the sidebar. You may also use PayPal for your purchase. Slowly but surely the dolls and plush animals are being completed. I'm still working on a host of them. 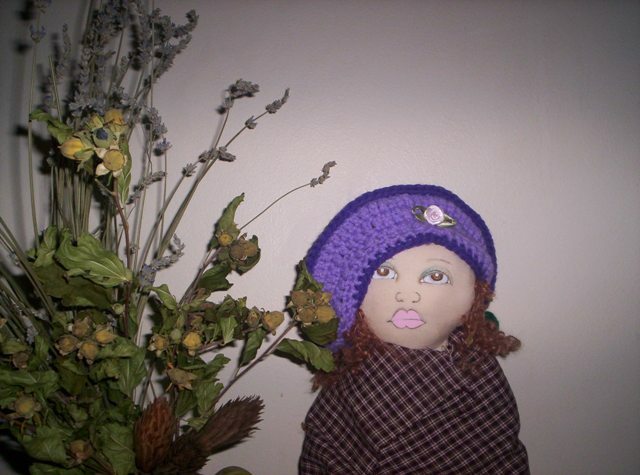 Soon I'll get myself to Hobby Lobby where I can purchase the right red hair for the little girl in the purple beret. As soon as I do I can finish her out fit and offer her for adoption. This is what she looks like right now as she waits for more hair. What I realized about the stuffed animals and bears is that I enjoy them much more when I paint them instead of sew, add eyes and clothes and that's it. I enjoy painting features on them and I enjoy making little characters out of them. Without a lot of paint strokes there isn't enough joy for me to put in time and effort. Now that I've figure out what it is I need to do with them to enjoy making them ( I need to paint their features) there should be more plush baby animals available. At this time I am unable to make special doll requests. I apologize for the inconvenience.